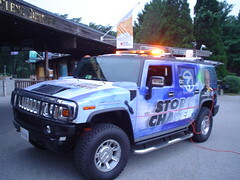 Here's a shot of the WJLA ABC7 StormChaser's visit to Wolf Trap this morning. Meteorologist Adam Caskey broadcasted weather updates from 5am to 7am on WJLA and spoke with cast members from Disney's Beauty and the Beast. More photos can be found in our Flickr account. Anonymous, that's a good question and one we've addressed here on the blog before. We never cancel shows because of the weather. Check out this post: "What Happens if it Rains? ", which also has a link to the Frequently Asked Questions section of the Wolf Trap website, where more details are listed on our ticket policies.